While I do support the idea of having dried, canned and frozen food-storage on hand for emergencies or difficult economic times, fresh food will always have center stage on my menu. I love it when I pick fruit and vegetables from a bin and take them home for immediate use...that is the best! Although the end of summer means less of that fabulous local garden abundance, at a recent September farmers' market, I was able to find beautiful tomatoes, green beans, cucumbers and summer squash still in good supply. I greedily loaded bags with these fresh items, and could hardly wait to take them home to begin another taste adventure. Some of the tomatoes were destined to become fresh tomato sauce and others were sliced or chopped to garnish egg dishes, sandwiches and other vegetables. What wonderful taste sensations! 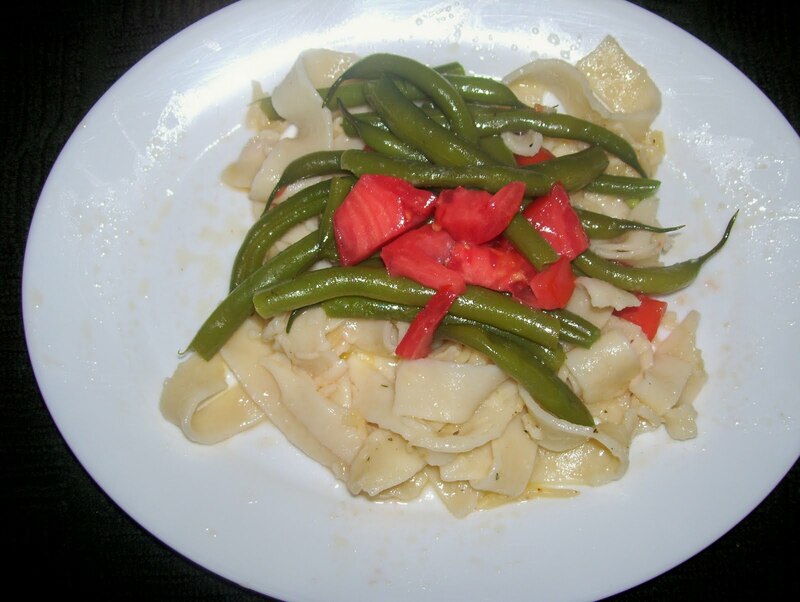 My favorite culinary creation, however, was comprised of steamed, fresh green beans with butter served over a satisfying Parmesan pasta and topped with chopped tomato. Not only were the colors amazingly inviting, but the wonderful combination of flavors surprised even me...so simple...so delicious. All quantities for this recipe are according to the appetite of those served. Wash and remove stem end of beans. Steam gently until crisp tender. Meanwhile, cook desired amount of fettuccine according to package directions. 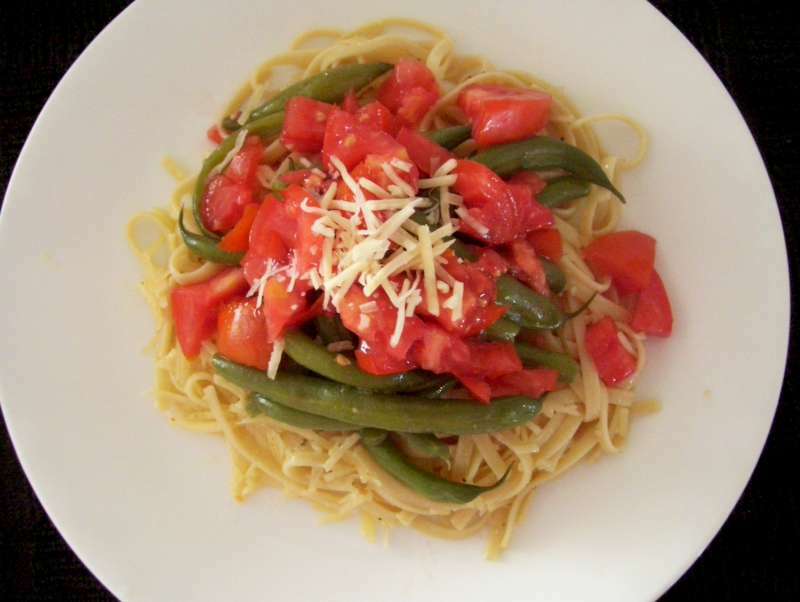 If using homemade noodles, cook in boiling, salted water until al dente…do not over cook. Coarsely chop 1/2 C of fresh tomatoes per serving. Drain cooked pasta and add 1-2 T butter per serving. Toss to melt butter and coat pasta evenly. Sprinkle with freshly grated Parmesan cheese and pepper blend; mix gently. Drain beans, add butter and toss to coat evenly. Place buttered, seasoned pasta on plates; top with buttered green beans and finish off with chopped tomatoes. Garnish with additional Parmesan cheese if desired. Serve immediately.